Two stories this weekend, frustrated me. Both were about the impact of $300,000,000 in the world. $300 million dollars I wish I could give. $300 million I wish I could take away. On Friday, The Wall Street Journal explained in a fascinating story, "Small Energy-Saving Steps can Make Big Strides," that even as we're working on big improvements in reducing our environmental impact, smaller, less glamorous options can "add up to major environmental progress -- and at a cost more palatable in struggling economies. ...[Options include the] lowly but effective efforts such as improving fuel economy in cars, better insulating homes and helping families in India buy $20 cooking stoves." It will be challenging to develop and gain adoption of enough plug-in hybrids to reduce oil usage more than about 7% by 2030. But by just improving mileage efficiency on vehicles from 26 to even 36 MPG it could be a 32% savings in oil usage! But, "if half the families in India began using improved stoves, the Atmospheric Brown Cloud would shrink by about one-third." Incorporating the low tech while developing and rolling out the necessary higher tech solutions makes good impact and good sense. "Envirofit International, a Fort Collins, Colo., nonprofit group, has sold some 100,000 stoves over the past year in southern India. The organization [ which, yes, is funded in part by the Shell Foundation, but also Google and the EPA] sells them largely out of vans that roll along dirt roads in rural villages. One study notes that 60 million stoves, if sold in India for only $5 each, would cost $300 million. Even if the stoves cost more, that rollout would be cheaper than most other clean-energy options." 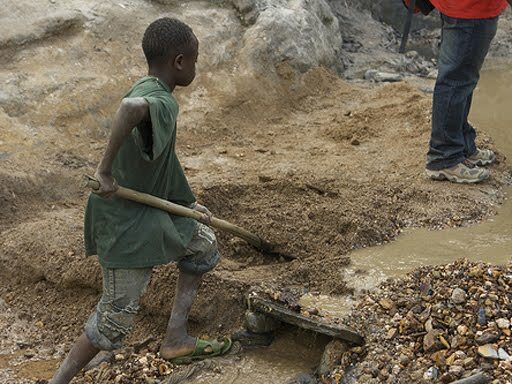 "...even if Congo's gold is less than 1% of the world supply, that still comes to more than $300 million a year - enough to keep the war going forever, mining an inexhaustible wealth of misery." $300 million is plenty to inspire and fund the warlords and rebels who force men and children to mine for gold for perhaps $1/day in "wages." If they survive. 5 million have died so far. "Jewelers know about the tragedy in Congo, but it has never been standard industry practice to trace gold to its source. Jewelers buy gold from middlemen; they don't ask where it comes from. ...It was seven years ago the industry banned so called blood diamonds from West Africa. But, up until now, it hasn't done the same for gold. ...And of the major jewelers [60 Minutes] talked to, only Tiffany said it can trace nearly all its gold directly to a mine; theirs is in Utah. Walmart told us it plans to trace the source of 10 percent of its gold products by next year." Do question the origins of your purchases and think about all the stakeholders and supply chains that go into those items.